Hi I just switched from Spotify and Deezer has been nothing but disapointment (Censored songs, it sometimes stops playing or wont play, etc) And now I just realized that the desktop app doesnt work either. It closes as soon as it opens. I've reinstalled it several times. Can someone help me? I have installed the app using your link, which redirects to Windows Store. The app is showing a blank page with nothing. The app started working after I moved it from D drive to C drive, where windows itself is installed. If I try to move it away from C drive, where windows is located, it just shows a blank screen. Rafael, please suggest developers to add a feature to save downloaded tracks on another drive or repair the bug with the app location. Hi there, thanks for letting me know. Some user are reporting the same and I will share this with them and with our devs! Thanks! Similar troubles with updated app here. I have installed Deezer app and use it for couple of years - without a problem. But I have encountered serious troubles in the past weeks. Suddenly I was not able to login using Facebook account. I was redirected to Web browser with message "you are with us", but I had no access to app (but I can still login to web version of Deezer with this Facebook account). So in the end I reinstalled Deezer app... and it went even worse. No login screen, just plain blank dark app frame with no user interface. Only user interface element was a title "Deezer Desktop" in the windows caption. Note: I' am running Windows 10 with user profiles (C:\Users\...) moved to drive during installation (using response file during setup). I found here a hint that Deezer now "wants" to be installed on C: drive... so I relocate the app to C: drive (using Settings -> Applications -> Deezer -> Move. It helped - partially: now the app has an user interface. But still - I cannot login using my Facebook account. I can login only using mail/password (I tried with a new registration). Please, could you fix these problems? Thank you for this, this is the only way ive been able to actually move the program. This needs to be the top result for everyone who's struggling. Seems you know more than Deezer who just keep telling everyone to reinstall. Well, Deezer used to work on D : drive before. And I see no reason why to force users to use C: drive for user profiles/applications (users with small SSDs definitely want to avoid putting there anything else but system). I've re-installed Deezer again today from Microsoft Store. And voilá... today it is installed on C: (as expected) and I can login into app using my Facebook account login! Hurray! I am in! Was an app updated and fixed? P.S. Still there are strange things going on. On the first app start, Microsoft firewall alert was triggered (strange - there shall be nothing suspicious within communication with streaming server?). I allowed Deezer access in private network. Also, one of my computers with Avast antivirus triggered red alert and wants to put Deezer into virus vault (I declined this app block). Other computer has only Microsoft Security (Defender) and there was no alert. AFAIK, there were no alerts and warnings from firewall and antivirus before. Strange. Using your local MP3 files within Deezer's desktop app is not possible in a direct way though, you can only upload MP3 files from your desktop PC or laptop to your Deezer account, and the uploader allows to choose the drive from where you upload. On the other hand it may become a problem if you are using the download option for offline mode a lot, especially in HiFi mode with FLAC files. 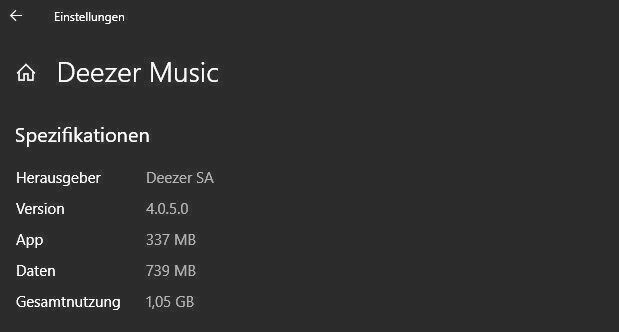 I don't, so Deezer's desktop app reports 0MB for the Smart Cache and Downloads usage in its settings for me. ...And I see no reason why to force users to use C: drive for user profiles/applications (users with small SSDs definitely want to avoid putting there anything else but system). For me, all issues seems to be solved by fresh (yesterday) uninstallation and re-installation of Deezer app. Hi @TomasK at the moment I am afraid you have to install the app on C drive, we will pass it on and hopefully developers will change this, but for the moment that is where you need to keep it. The login problem has been reported as fixed. Let us know if you are still having problems with it. Thanks for the the reply. As I wrote in the post above - problems seem to be fixed, at least for me. a) Installation of app from Microsoft store gives no choice of configuration (e.g. the selection of drive for installation). b) My default app drive is C (whether for classic or modern apps). c) My user profiles folder is moved from C to D (during Windows installation, using response file). I never had any problem with this setting with any app - except Deezer. I am not sure how this bug affected (or still affects) users with default app folder on other drive than C.
Thanks for the feedback! We've passed it on for future versions.